The first Google Buzz client is now in the app store, The Next Web’s Tim Difford reports. 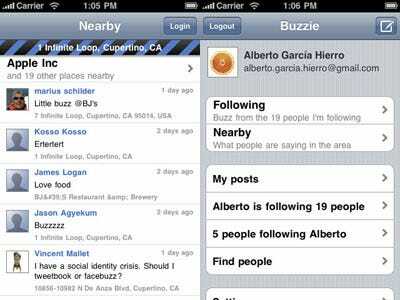 Buzzie, from developer Alberto Hierro, gives you full access to your Buzz account, and also lets users who don’t have accounts (or don’t want to sign in) see what people are buzzing up in their area. Users have the option of letting Buzzie include location data from their GPSes in their buzzes. Google already has its own mobile web app for Buzz, but there will no doubt be dozens of third party clients like Buzzie before long. The app costs $1.99 this week, but will be bumped up to $2.99 thereafter.